While dining at the Olive Garden recently, I noticed a menu item was now on their menu that they brought back due to popular demand. 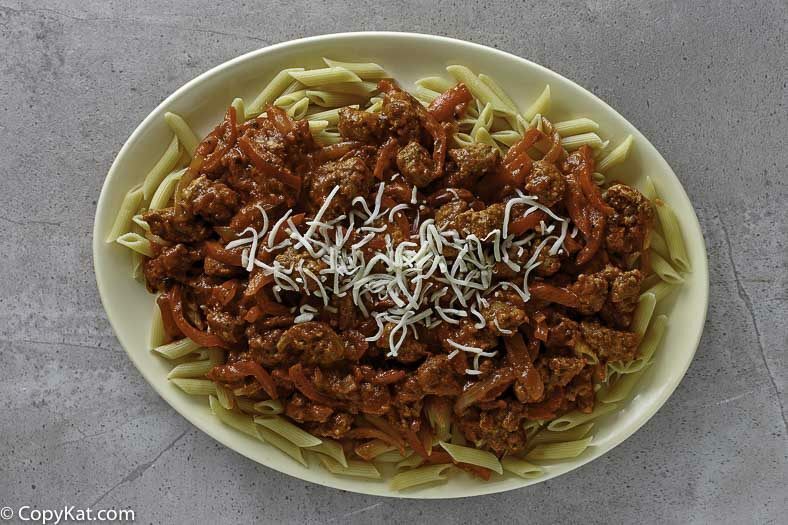 Olive Garden Sausage and Pepper Rustica is a fabulous dish to make, it easy to prepare, and makes an inexpensive and filling dinner. 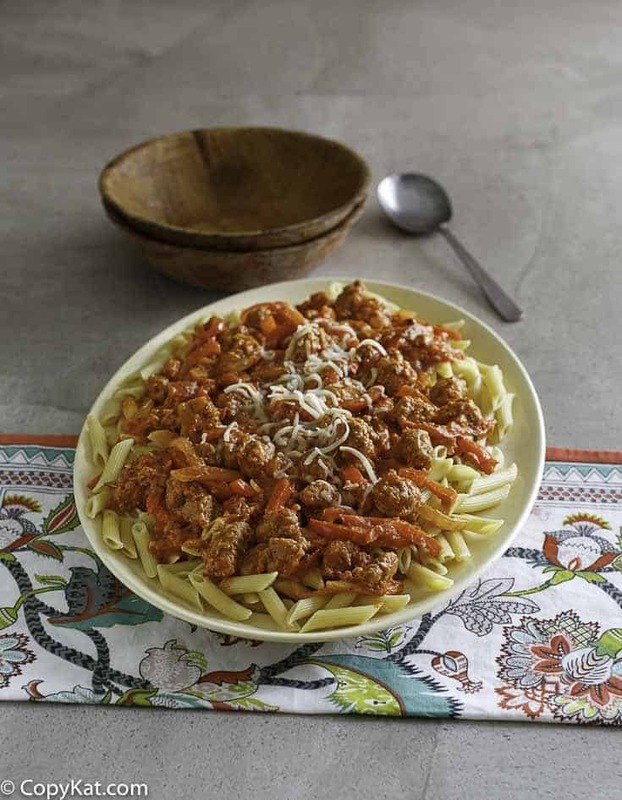 Olive Garden Grilled Sausage and Pepper Rustica is a dish combines Italian sausage, fresh mozzarella cheese, and peppers to make this flavorful dish. I love that there is a hint of spice which really brings out the flavor of Italian sausage. They make their dish with penne pasta, but if you don’t happen to have any of this on hand, I think any pasta that you have will do. If you want to be low carb or gluten-free, you can take a pass on the pasta. It makes a hearty dinner all by itself. For my recipe, I used red and yellow bell peppers. This is primarily due to the fact I hate, loathe, green bell peppers. Please feel free to use any type of bell pepper that you and your family enjoy. I have made my dish with spiral pasta. If you wanted to make this recipe low carb you could use some of the low carb pasta, or even some of the whole wheat pasta for this dish. The Olive Garden Grilled Sausage and Pepper Rustica was soo good when it was removed to the menu it was brought back due to popular demand. Now you can make it at home. 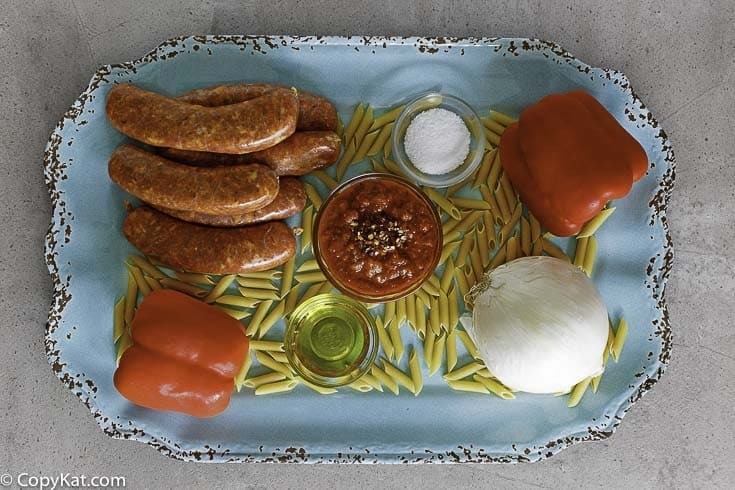 In a large skillet over medium heat, pour 1 tablespoon of olive oil, slice sausage into bite-size pieces and cook sausage until browned. Remove sausage from pan and set aside. Add remaining 1 tablespoon of olive oil to the pan and add sliced peppers and onions and season with salt and cook until onions are transparent, and the peppers have cooked until they are tender. Add browned sausage to pan and stir thoroughly. If you want this to be spicy add red pepper flakes 1/4 to 1/2 teaspoon depending on how spicy you want. Add sauce to pan and heat well. Add 1/2 cup shredded mozzarella cheese and stir in melted cheese. Pour this over cooked pasta and mix well. This is not even close to the Olive garden recipe. It’s 2 GRILLED Italian sausages sliced, red green and yellow peppers plus red onions all julienne sliced, garlic, and hot chili oil sauteed until soft on high. Place knobs of mozzarella evely throughout pan, cover with a small amount of marinara sauce on medium low heat until the cheese knobs melt. Add Al dente penne to half the pan and turn to coat without disturbing the cheese knobs. flip the entire thing once so all the sauce lands on top of the pasta and the melted cheese knobs start to stretch. Slide out of the saute pan and into a pasta bowl. Add parm cheese on top. That’s literally how it’s made I used to work there. Thank you for this, it isn’t what I have been served there. Much appreciated. My hubby loves this except for I use angel hair pasta instead of penne. I like it either way. I know Angel hair pasta is super quick to cook! I made this dish for the 1st time yesterday. I used my home made fusilli (do you have the KitchenAid pasta extruder attachment? It’s makes pasta making so easy!). My husband loved it! The sauce with the addition of peppers and onions, and a few red pepper flakes adds so much! Another new favorite! Thank you, Stephanie! I made this dish last night and found it to be very delicious and actually pretty easy to prepare. I’ve always loved the Sausage and Peppers Rustica at The Olive Garden and this is definitely very close to their recipe. I did end up adding a little white wine and a fresh minced clove of garlic and I used 1/2 tsp. of the red pepper flakes because I like a little kick. Other than that, I followed the recipe to a T. I will definitely make this again! Linda S, love what you did to the recipe. When I recreate recipes I just try to make them as close as I can to the restaurant. I totally love the white wine and the fresh minced garlic! Made Olive Garden Grilled Sausage and Pepper Rustica for supper tonight. Added lots of garlic, crushed fennel, onion powder, Italian spices, wine, and small can of tomato sauce. Used only half the pasta. Rockin’ AWESOME flavor. Hubby ate three helpings and told me to never lose that recipe. too good to be true. I had a chance to view some of your cooking videos and I want to make ALL of them. Thanks for timesaving yet delicious ideas!! Liz, thank you for your kind words. I hope you try out some recipes, and let me know if there is something you are looking for! It’s a seasonal dish that Olive Garden brings back every year, but you can get it any time if you ask. It’s my husband’s favorite and he’s going to be THRILLED when I make this! I love being able to make those seasonal dishes any time of year. I made this recipe but used Barilla low carb spaghetti. Added a pound of mushrooms and a can of black olives.Great taste and liked by all. Great idea on the low carb spaghetti. Love the addition of mushrooms and black olives. Course, I think mushrooms go well with most everything! Luri, next time I make, I will make it your way!